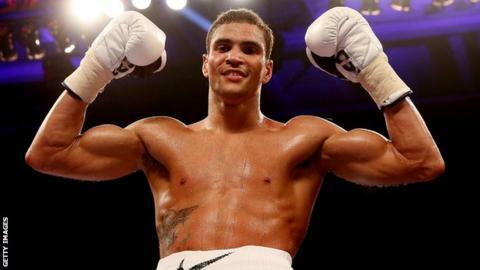 Anthony Ogogo has said being on the Floyd Mayweather versus Marcos Maidana bill has strengthened his desire to become a headliner. Britain's Ogogo will fight Jonel Tapia on the Las Vegas undercard on Saturday. "Being around a Mayweather fight is a different kettle of fish," the 25-year-old middleweight told BBC Sport. "I'm very lucky, humbled and proud to be fighting on his undercard. It gives me a massive incentive to one day be the Mayweather at the top of the card." Undefeated WBC welterweight world champion Mayweather will fight WBA champion Maidana in a title unification bout at the MGM Grand. Lowestoft's Ogogo won middleweight bronze at London 2012 two years ago and, after being signed by big-time USA promoter Golden Boy, is undefeated in five professional fights. He was set to make his Vegas debut in September, when Mayweather beat Saul Alvarez, but pulled out through injury, and is experiencing his first taste of the Nevada city this weekend. "When Floyd Mayweather fights the boxing world comes to a standstill. I can't explain how big it is," he said. "Two days ago they snuck me out of the back of the MGM Grand, into a big golden limo and drove me 10 yards to the front of the hotel. It was like I was on the set of a massive film premiere. That's how big it is over here. "The other day we did a public workout in front of 1,000 people and film crews from all around the world. "This is only my sixth fight. A lot of British fighters will be fighting in a working men's club in their sixth fight, not the MGM Grand. "So I do feel really lucky. But I've still got so much more to achieve and by the time it's my 26th fight it will hopefully be me at the top of the card in Vegas." This will also be Ogogo's first eight-round bout, having gone the distance in three of his six-rounders so far. Tapia, a New York-born, Puerto Rico-based 24-year-old, has a record of eight wins, with five by knockout, and four defeats, all by knockout. "I want to put on a great display because when the next Mayweather event comes to Vegas, I want the nod to be on it again," said Ogogo. "I'd like to knock him out, don't get me wrong. It's an entertainment business. "But if it does go the eight rounds, I'll be a better boxer for it."